My son loves Bakugan and asked me to make his favorite guy Robotalian. We didn’t have a lot of guests to feed so this is a 9×13 pan with 2 layers – vanilla cake with chocolate cream center, yum! I used the card to design the cake and printed out an enlarged image to trace on the fondant. For the point circles on the side, I used vanilla Oreos and colored them and then used royal icing to do the writing. 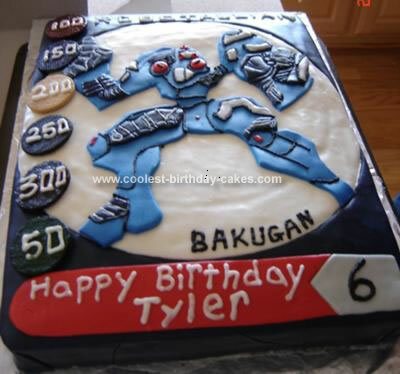 This homemade Robotalian Bakugan cake was a huge hit and the smile on my son’s face was worth all the time spent on it! Happy baking! Could you please tell me where to find the image. I want to surprise my nephew but don’t have that particular card and have bought many packs without any luck. I know it’s his favourite but it goes everywhere with him.